Menstrual cramps, also called dysmenorrhea, are cramping aches and pains that typically affect the lower abdomen but may also radiate to the lower back and thighs. Thought to be caused by excess levels of prostaglandins (hormone-like substances linked to pain and inflammation), menstrual cramps often occur just before and during the first few days of a woman's menstrual period. Some women also experience loose stools, headaches, nausea or dizziness. For many women, menstrual cramps occur without an underlying health condition (such as endometriosis). But if you're experiencing regular or severe cramping, consult your doctor to see if you're suffering from an underlying health issue that might be causing the pain (such as endometriosis, pelvic inflammatory disease, or uterine fibroids). This warming herb may help ease cramps and soothe menstrual troubles by lowering levels of pain-causing prostaglandins (as well as fight the fatigue commonly associated with premenstrual syndrome). In a 2009 study, women who took 250 mg capsules of ginger four times a day for three days from the start of their menstrual period experienced a level of pain relief equal to that of study members who treated their menstrual cramps with ibuprofen. Another study, published in BMC Complementary and Alternative Medicine in 2012, analyzed the use of ginger root powder or a placebo in 120 women with moderate or severe primary dysmenorrhea and found that there were significant differences in the severity of pain between the ginger and placebo groups. Those taking ginger root powder two days before the onset of their menstrual period and continuing through the first three days of their menstrual period had the shortest duration of pain. The Cochrane Review of these studies said the quality of the evidence was low, but the direction of the effect was consistent. Ginger has other purported health benefits. 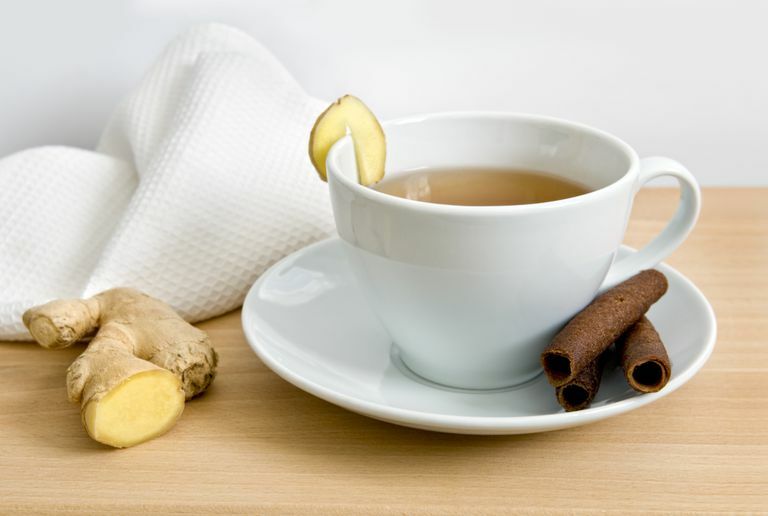 Whether you believe them or not, you may enjoy making your own soothing ginger tea, especially during your period. In a 2008 report, scientists sized up 39 studies (involving a total of 3,475 women) and concluded that Chinese herbs may alleviate menstrual cramps more effectively than over-the-counter pain medications. Most study participants were given formulas containing five or six herbs (used in traditional Chinese medicine), such as Chinese angelica root, fennel fruit, licorice root, cinnamon bark, and red peony root. According to a survey published in the Journal of Ethnopharmacology in 2014, the herbal formula most frequently recommended for primary dysmenorrhea in Taiwan is "Dang-gui-shao-yao-san" which contains Dang gui (Angelica sinensis) and Peony powder and is believed to have sedative and anti-inflammatory compounds. An herb with a licorice-like taste and celery-like crunchy texture, fennel contains anethole (a compound with anti-spasm effects) that may help to ease menstrual cramps in some women. The available research includes a study published in the Iranian Journal of Nursing and Midwifery Research in 2015 that examined the effects of a fennel extract (fennelin) and vitagnus compared to the pain medication mefenamic acid for primary dysmenorrhea. For the study, 105 women with mild to moderate dysmenorrhea took either fennel extract, vitex extract, mefenamic acid, or a placebo. During the two cycles after the intervention, both fennelin and vitagnus had a greater effect compared with the mefenamic acid. However, the Cochrane Review of this study said the evidence was of very low quality. Extracted from the bark of pine trees, the supplement Pycnogenol was found to significantly diminish pain and reduce the need for analgesic pain medication among a group of women with menstrual cramps in one 2008 study. Another small study in 2014 also found pain reduction when taking Pycnogenol and an oral contraceptive for three months. However, a Cochrane Review of claims for this supplement's effects for other chronic conditions found no sufficient evidence of effectiveness. If you're considering using herbs (or other forms of alternative medicine) for menstrual cramps, it's important to talk with your doctor first to weigh the pros and cons. If you have severe menstrual cramps, it could be a sign of problems that need to be assessed by your doctor. Pan JC, Tsai YT, Lai JN, Fang RC, Yeh CH. The Traditional Chinese Medicine Prescription Pattern of Patients With Primary Dysmenorrhea in Taiwan: A Large-Scale Cross-Sectional Survey. J Ethnopharmacol. 2014 Mar 14;152(2):314-9. doi: 10.1016/j.jep.2014.01.002. Epub 2014 Jan 10. Pattanittum P, Kunyanone N, Brown J, et al. Dietary supplements for dysmenorrhoea. Cochrane Database of Systematic Reviews. 2016. doi:10.1002/14651858.cd002124.pub2. Suzuki N, Uebaba K, Kohama T, Moniwa N, Kanayama N, Koike K. French Maritime Pine Bark Extract Significantly Lowers the Requirement for Analgesic Medication in Dysmenorrhea: A Multicenter, Randomized, Double-Blind, Placebo-Controlled Study. Journal of Reproductive Medicine 2008 53(5):338-46. Zeraati F, Shobeiri F, Nazari M, Araghchian M, Bekhradi R. Comparative Evaluation of the Efficacy of Herbal Drugs (Fennelin and Vitagnus) and Mefenamic Acid in the Treatment of Primary Dysmenorrhea. Iran J Nurs Midwifery Res. 2014 Nov;19(6):581-4. Zhu X, Proctor M, Bensoussan A, Wu E, Smith CA. Chinese herbal medicine for primary dysmenorrhoea. Cochrane Database of Systematic Reviews. 2008. doi:10.1002/14651858.cd005288.pub3.